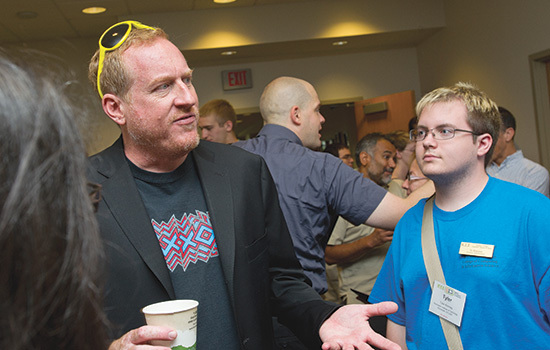 Down time at the Games Innovation Conference allows RIT game design and development students like Tyler Kimmey, above right, to talk with Seamus Blackley, &#8232;Xbox co-creator. Blackley stressed getting back to the roots of video games. &#8232;He sees the 99-cent download as the new quarter drop from arcade days. Back in the 1970s, there didn’t seem to be a stigma associated with playing video games, viewed as hip and futuristic. It was common to see men, women and children of all ages lined up at mall arcades, with pockets full of change, waiting for a chance to play Pong and Space Invaders, some of the first commercially successful arcade video games. As a result of this popularity, video-game developers began to mass-produce half-working, low-quality games, which led to the North American video-game crash of 1983. Suddenly, video games had become a hobby only for “computer people.” Revenues that had peaked at approximately $3.2 billion in 1983 fell to around $100 million by 1985. At the fourth Consumer Electronics Society International Games Innovation Conference, “Designing for Play,” hosted by the Institute of Electrical and Electronics Engineers, Sept. 7-8, in Rochester, N.Y., gaming innovators converged to analyze the past and envision the future of the video game industry. Keynote speaker Seamus Blackley, Xbox co-creator and president of Innovative Leisure, reminded gaming professionals and students that history tends to repeat itself. Blackley says that new social and mobile gamers are similar to the large chunk of gamers lost in the early 1980s. He explained that in our era of the “new arcade,” where it is acceptable for everyone to play, developers need to make games that entertain and teach players, not just rip profits from them 99 cents at a time. The conference featured more than 40 presentations covering the leading edge of thinking and practice on human interaction, education, business, game play and speculative fiction in relation to games. Dustin Kochensparger, a third-year game design and development student from Groveport, Ohio, notes that many speakers focused on the usage of games that serve some purpose of teaching and engaging the player in meaningful learning.